Can be seen on Phil's board during his 2018 'Duo' tour. We see at 13:43 that he is using a EBS Multicomp. 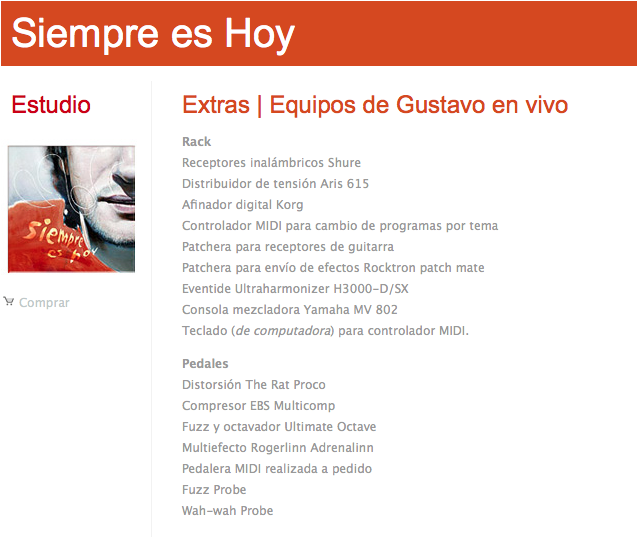 On Gustavo Cerati's [official website](http://cerati.com/siempre_es_hoy/extras/), an EBS Multicomp Compressor pedal is listed among Cerati's pedals. "...into the EBS. They make this great comp that he just enjoys," says John Campbell's tech, at 27:50 in this rig rundown video. Barend from @blindguardian knows his stuff! Repost from @barendcourboisbass - WORLD'S BEST BASS COMPRESSOR !! DON'T LEAVE HOME WITHOUT IT !! > The second is an acoustic board designed for Colin Hay of Men at Work. Colin wanted a very versatile system that was state of the art. It allows him to blend his dry acoustic sound with stereo effects. A custom box was built by Martin to allow a DI feed and stereo XLR through the pedals to the house as well as a mono amp send. The box also allows a master mute of all outs to the tuner and a mute of the XLR's and amp send individually. The XLR's are ISO'd with two Jensen Transformers. The signal chain is as follows: Custom switching box---Demeter Tube DI---EBS Comp----Durham Sexdrive----Fulldrive II----Boss Loop Station---TC Modulator----TC Nova Delay---Swith box. The Demeter tube DI is an incredibly natural sounding piece. The TC pedals blended in stereo are amazingly spacious. After the Valve Drive is a MultiComp, again, by the same company: EBS. In this photo from Steve's twitter post, an EBS Multicomp and bee seen in the middle row. You can see this compressor pedal on Matt's pedalboard in the rundown. At 1:45 ,Davie showed his EBS MultiComp Compressor pedal. At 1:45 minute mark, Biale showed his EBS MultiComp Compressor pedal. "Listed among the artists in this magazine issue." No reviews or videos yet for EBS MultiComp True Dual Band Compressor Pedal. With an Equipboard account you can rate this item, add it to your collection, submit a review to discuss what you like and dislike about it, and associate EBS MultiComp True Dual Band Compressor Pedal to artists that use it. Create an account!